Don’t Plug Your Socket Into A Wall, Plug It Into A Window. 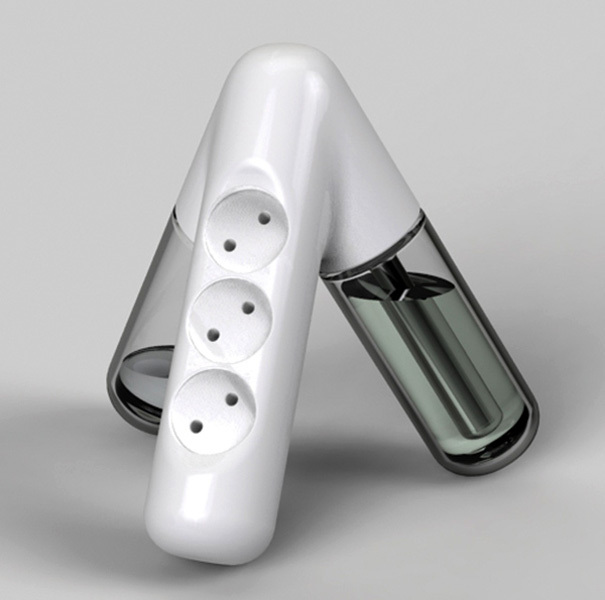 Granted that the current ‘Window Socket’ features European plugs, it is still an idea so fabulously simple, it’s slightly amazing that we haven’t seen one before. 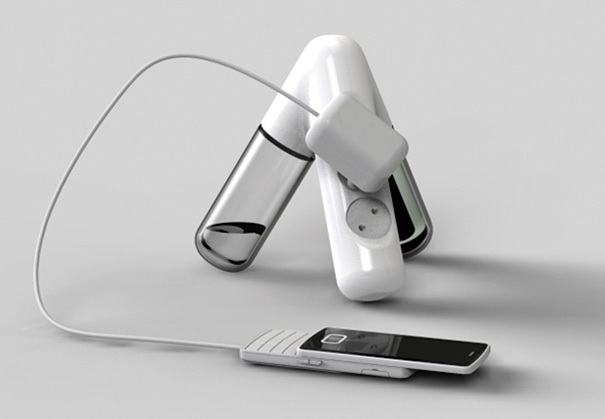 Designed by Kyuho Song & Boa Oh, the charger sticks to a window and draws solar power to an internal battery, which enables one to either plug small devices into the outlet right there and then, or save the stored power for use during night-time hours. Kyuho Song & Boa Oh “tried to design a portable socket, so that users can use it intuitively without special training.” It sticks to a window with a suction plate that encircles the solar panel, and a basic outlet feeds the converted solar power to a device—and that’s pretty much it. As the designers point out, this is a charger/converter that can be used anywhere there’s daylight, particularly where there is restricted use of electricity, such as outdoors or on a plane. At present, the Window Socket is still a concept, but in the near future the designers hope to increase its efficiency, energy storage and charge time. The battery on the Window Socket is very small, at 1000mAh the stored power might be about enough to charge a mobile phone, particularly if it were a USB outlet rather than a standard one, but it won’t be enough to power household appliances. And while it can provide 10 continuous hours of power on a full charge, it presently takes about 5-8 hours to fully charge. But even that can’t completely take a way from it’s awesome, simple design. Solar Blinds That Charge Your Phone? The Rolar Blinds do three things. They harness the energy of the sun, they cut the glare of the sun out during the day, keeping your indoors ambient, and they look absolutely gorgeous while they do the above two. The Rolar Blinds stand at the crux between new-age photovoltaic printing techniques, a rise in demand for solar panels, and absolute graphic beauty, as they explore printing solar cells in manners that almost feel like graffiti, but with a more direct purpose, i.e., charging your devices. At the bottom of the blinds rest the cylindrical weights that come with a USB port that let you charge your devices or your power-banks by simply plugging them into the curtain and leaving them on a table nearby or the windowsill as you tap into the solar system’s largest (free) power source. The cylindrical members (battery packs) are even detachable, allowing you to carry your power with you. However, the convenience of the Rolar Blinds takes second place to its graphical beauty that bring art and technology together beautifully and seamlessly. As much as I’d like, Solar Power hasn’t become mainstream yet. I guess not many people have really seen how useful it can be. Apart from solar panels on your roof, no one has really explored alternative uses for these panels. Why? Because they’re bulky, expensive, and for the longest time, they were breakable. But now technology’s solved all those problems for us. The Heli-on is a testament to that. Designed to fit into the grip of your palm, this pocket sized wonder has its own flexible solar panel rolled up cozily into a cylindrical outer casing. It also has its own inbuilt battery that allows you to charge your devices when Mr. Sun is a’hiding. Use the solar panels to directly charge your devices, or to charge the Heli-on itself. Stuck without sunlight? The Heli-on is still a good investment because it charges via USB too. Don’t ever run out of batteries on your phone because you played too much Two Dots ever again. The Eco Power Strip is an alternate energy production source that bypasses traditional oil and the new-age hydrogen alternatives. Electricity is produced by electrolysis – the combination of oxygen with hydrogen in bio-ethanol (DEFC: Direct-ethanol fuel cells), using energy without carbonic acid gas. The tech is viable but will we ever see this in practical applications? The world may never know.